These simple guest bedroom ideas will help make your overnight guests feel welcome in your home! Living up here on the ranch, we do a lot of traveling, and any time we need to get to a big box store, we face a 2+ hour drive. This leaves us staying as overnight guests quite often. Usually we stay at my mother-in-law's which is great (we consider it a second home), but a lot of the time we find ourselves at the home's of friends and family. I am always amazed by how comfortable our host/hostess makes us feel. Over the course of the past few years, I've picked up on some great ideas from those who were gracious enough to open their homes to me. Below are some of the best ways you can make overnight guests feel welcome in your home! It’s the little details that make a big difference, and I hope you get inspired to make things a little extra special for your next visitors! Plus towels are such a treat! It's not something we absolutely need every day, but it's something we can definitely appreciate when they are offered to us! That's why you should always give your guests the best towels. When they step out of the shower, you want them to feel invigorated and cared for. I suggest buying all white towels, that way you can bulk wash them with some non-chlorine bleach (it's less damaging than regular bleach), to keep them looking brand new. 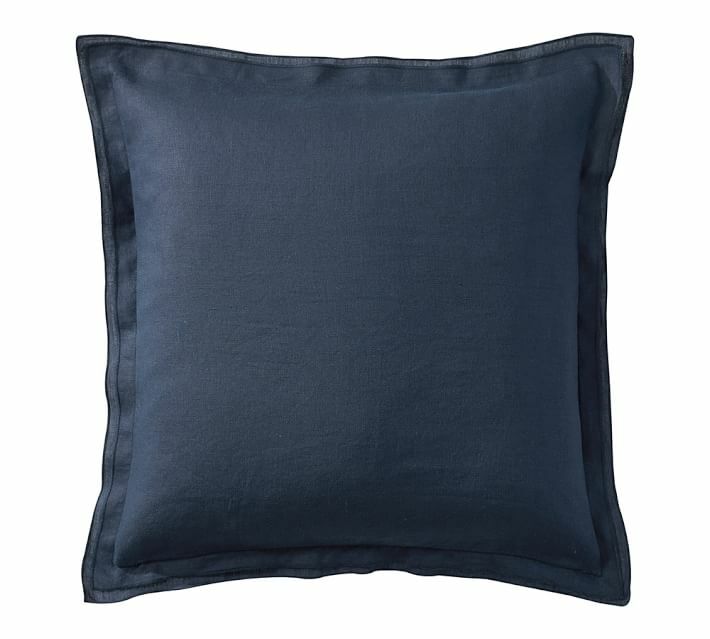 Are you the type of person who prefers a firm pillow? Soft? Chances are your guest has a preference too! Make sure you've got both soft and firm pillows on the bed. You don't want your guest to wake up with a kinked neck. Additionally, make sure the bedding is cozy and comfortable! That doesn’t necessarily mean you have to spend a ton of money! Target offers a great line of jersey sheets that are incredibly comfortable, I love these vintage striped sheets too! If you’d like to spend a little more, 100% linen sheets are the ultimate in luxury! Your guests don't have all of their everyday items with them, so it’s nice to offer them some slippers and a robe to stay warm and cozy as they start and end their day. After they dry off from a shower, or are preparing for bed, it’s such a nice touch to place a robe and some slipped out. 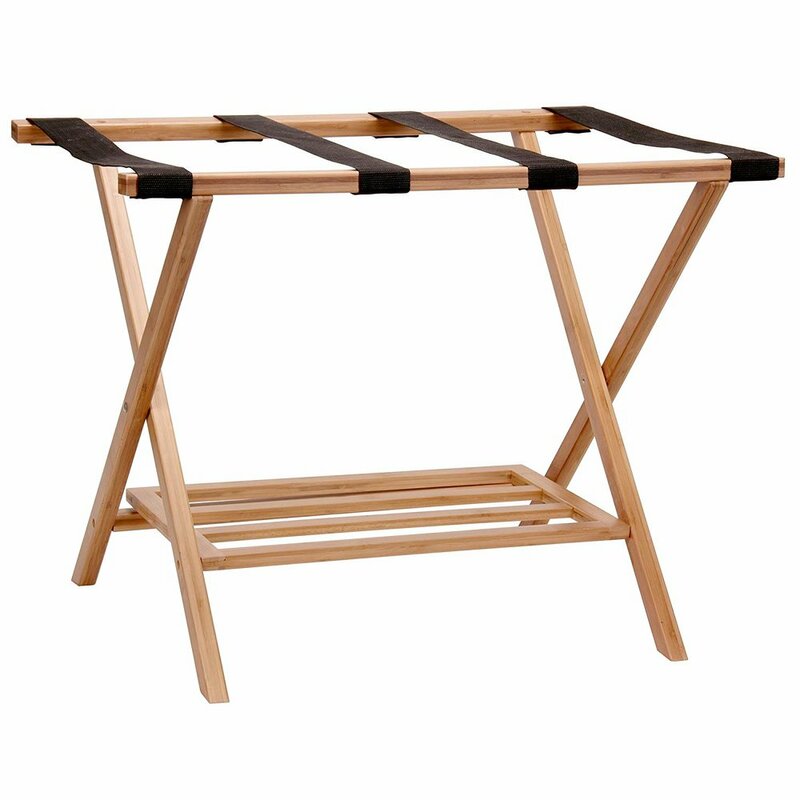 Offering a luggage rack will give guests the opportunity to place their belongings up and off the floor. This is nice to keep things tidy and keeps them from having to bend over to shuffle through their belongings. Chances are, you can find a luggage rack at a local thrift shop - and it won't go to waste! Leaving a few high quality hangers and an ironing set or steamer in the closet is always a nice touch too! Nowadays, sharing the WiFi password is a must! From experience, it's very awkward to ask for the wifi password. Leaving a piece of paper with the connection instructions is an excellent idea to let your guest know: it's okay to browse! A bedside table lamp is the perfect evening light for reading. Leave the light on so that guests can find their way to their bed without tripped over luggage or shoes. There’s a reason hotels get away with charging $4 for a bottle of water. Most people wake up at least once throughout the night to quench their thirst. Help your guest feel at home by leaving out a bottle of still and sparkling water, plus a few snacks for those late night hunger pangs. I love using refillable glass water jugs which are great for the environment, plus feel a little more intentional than a plastic bottle of water. It’s such a nice touch to leave out toiletry necessities. Things like dental basics, q-tips, razors, face wash, facial moisturizer, body lotion, soap, shampoo and conditioner. Your guests will be incredibly grateful to not have to ask for toothpaste or shampoo in the case that they forgot to bring any. In addition to bathroom necessities, I also suggest tucking away a few feminine hygiene products, contact solution, deodorant, hair basics (dryer, styling cream, spray, brush), and even a nail file. These things are somewhat uncomfortable to ask for, but will always come in handy for guests. This is a great time to put those face mask and deep conditioning treatment samples to use! It’s a wonderful touch to leave out a few extra special beauty items for your guests to use while they are visiting! Everyone’s body temperature fluctuates differently, so offering an extra blanket will help those that are naturally cooler feel more comfortable. This allows your guests to cozy up and sleep well! If you plan on printing out the wifi instructions, consider including the steps to working the TV and thermostat, or make a note to show your guests how to do these tasks. These are things that come naturally to you, but since every TV and thermostat is different, it’s nice to show guests how to operate them. This is one of my favorites! Whenever I have a guest coming over, I make sure to leave out the latest issue of People or Better Homes and Gardens. Depending on who you have coming to stay, you might consider leaving out the newspaper, or a publication about your local area! It might be hard to peel yourself out of bed before your guest, but you wouldn't want them to have to figure out the coffee pot by themselves would you? Set your alarm a bit early to prepare a welcoming wake-up for them. A tray with an empty mug, different kinds of milk and sugar, and perhaps a scone will do the trick! A living plant or vase of fresh flowers helps a room feel alive and beautiful! Even a single bud in a vase will stand out to your guest. Fresh flowers show them that you put time, energy, and effort into their arrival, and will make them feel loved and welcome! Traveling disrupts our natural schedule and throws off our sleep patterns. 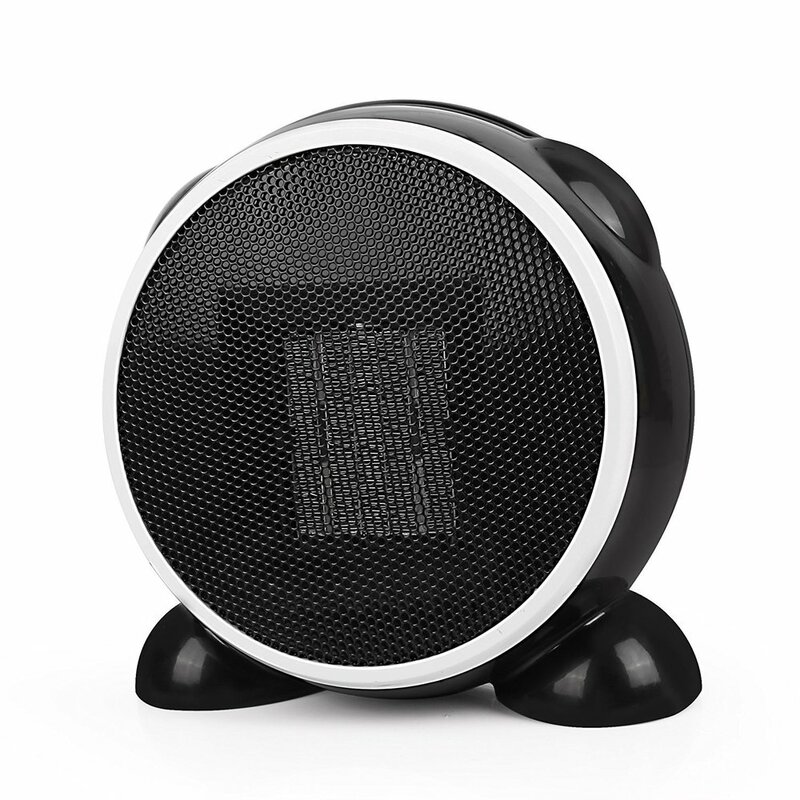 Offering a sound machine helps guests rest easy and get a good night sleep! This is a wonderful item to offer for guests that use a sound machine at home, but didn’t pack it with them. While not very expensive, it will be much appreciated! During the summer months, leave a portable fan out for your overnight guests to use to stay cool! On the other hand, during the cooler months, offering a small portable heater is a nice touch to help keep them warm and cozy. This is especially helpful if your guest bedroom doesn’t get as much air flow as the rest of your home. If your guests have forgotten a charger, it’s so nice for you to offer them in their room to use during their stay! 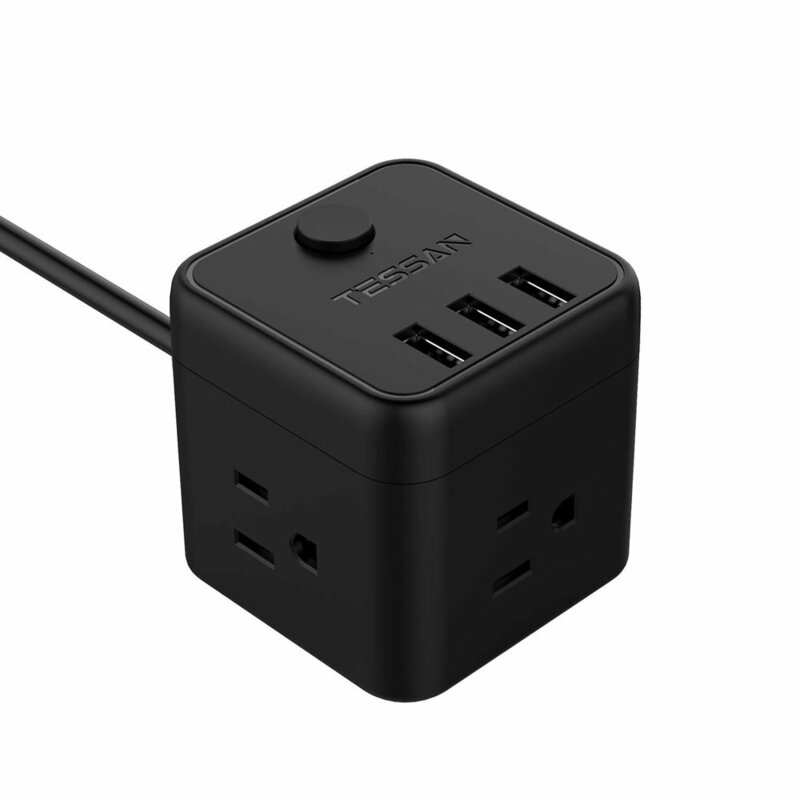 This extension cord is the perfect thing for guest bedrooms because it allows for many things to be plugged in at once, and includes USB ports to accommodate most phone chargers.